I may catch a little heat from our rogue friends as I have a strong suspicion that many will feel this set has been placed too far down the list, and for good reason… surely the tier 2 Bloodfang armor it is a top 10 set! I would have said the same thing prior to my research because this is a great looking set. 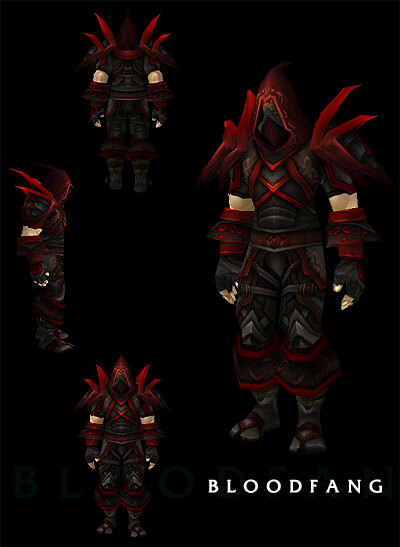 From the deep multiple shades of blood red color to a very stealth like helm, the Bloodfang embodies many of the best rogue elements to date. The fact that this set is placed at number 11 is more of a testament to how many great tier sets are out there than any knock against the truly nefarious looking Bloodfang set. Fear not though Rogues, we are not done with your class representation in our 30 Days of Diversity. This entry was posted on July 13, 2011 at 11:25 pm and is filed under General, HFL, MMO, Raiding, Role Playing, World of Warcraft. You can follow any responses to this entry through the RSS 2.0 feed. You can leave a response, or trackback from your own site. Easily my favorite set of all time!